Had an amazing time up in Saratoga this weekend with family, friends, horses and happenings. Thanks to everyone who made it up and out, I certainly had a blast and Travers Weekend is consistently one of my favorites of the year. I didn't do so well on the horses, just hitting one true winner on Friday, but I also didn't bet heavily at all this year. 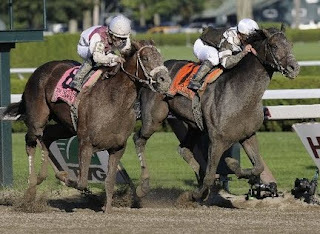 In the closest Travers Race in my memory Afleet Express won literally nosing out Fly Down in a photo finish! I stuck with my initial feeling betting on A Little Warm who ended up being 5th. An exhilarating race that couldn't have been any closer. Maybe I will post some pictures from the weekend in the future, but now onto the show. This date should set off alarm bells for most deadheads as it is Jerry Garcia's birthday (and also my sisters who was celebrating her birthday at SPAC). We in attendance were hoping for a bit of the old magic from the boys on this night in the glorious surroundings...but first, just who the hell are these boys!? Since Garcia's death in 1995 the remaining members of the group have toured with a host of guests, and formations. Sometimes the original members of the family go missing for various reasons (business, personal, health). Some tours really clicked, others were a bit of a let down. 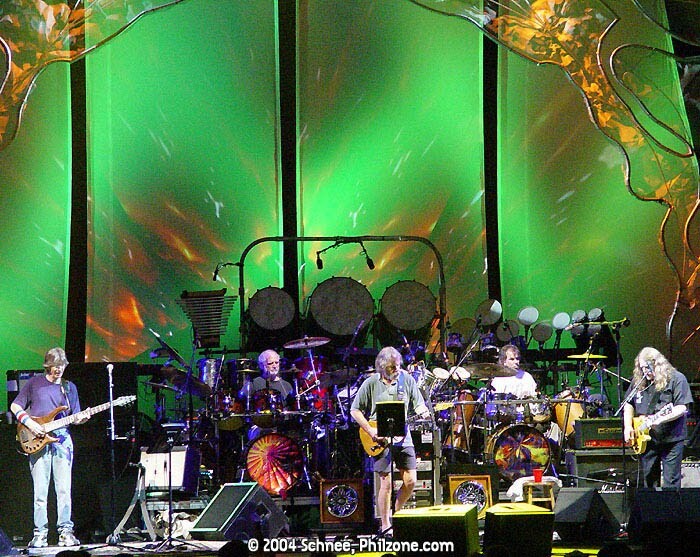 I feel that this particular tour featured one of the better post-Jerry groups the fellas have formed. 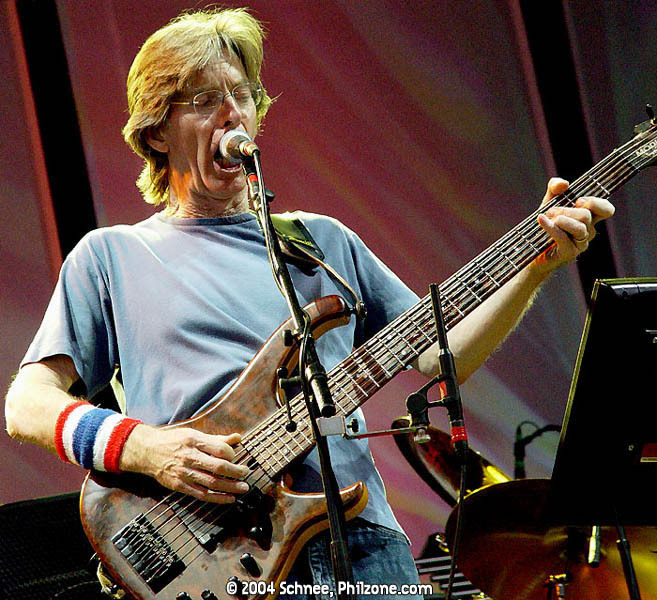 In my opinion the Phil Lesh Quintet was the most exciting and the best (so far) of the A.J. (after Jerry) groups that any of the original members have been involved in. There were no real rules in that group with the members being allowed to experiment nightly and with a healthy Phil the energy and tempos were usually rollicking, much more high tempo and alive then any later day Dead shows. 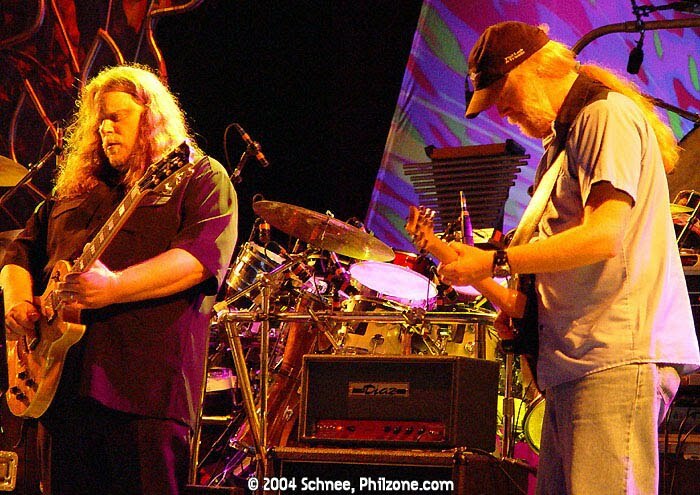 That group treated the songbook of the Grateful Dead as a guide and would fly off away from it nightly on the wings of the rip roaring guitar duels from Jimmy Herring and Warren Haynes who both joined the four main members (Weir, Lesh, Hart, Kruetzmann) for this summer tour. 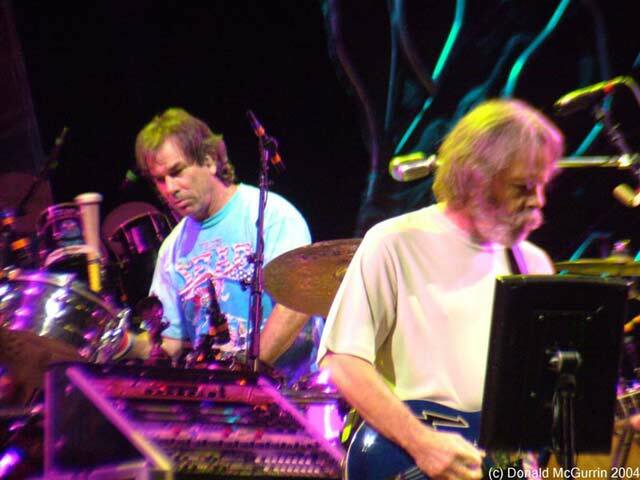 Supporting the newly christened "The Dead" on keys in the summer of '04 was the excellent Jeff Chimenti who played so winningly with Les Claypool and his Frog Brigade. These talented musicians were in the midst of their second leg of a summer tour when they came to SPAC on the first of August in 2004. What followed was an interesting if somewhat uneven night of music that seemed to feature pieces from all over this particular bands travels and past history with a first set that didn't even slightly hint at the coolness that was to come in the second. The quality of this recording is all you can ask for from an audience taping. All of the levels seem to be even with a healthy does of Lesh, if anything the overall volume may need to be pumped a bit, but nothing stands out as bad on the tech/specs front. 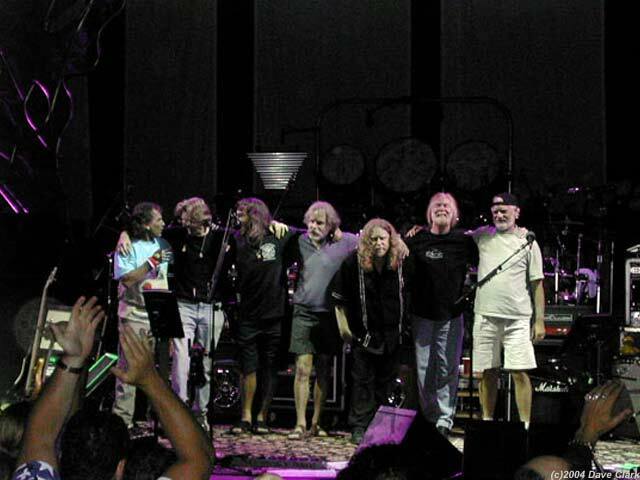 Like most shows this tour, this one started with a jam, a trend Phil had been using in all of his groups, and then the band seemed to abruptly quit it and just start playing the fan favorite and first tribute to the bearded one on the night, "Uncle John's Band". "Lazy River Road" is forgettable and fumbled through as the band tries to pass off verses to each other and then seems to forget who is singing what. Phil steps up and dedicates the highlight of the first set to a Kirk Kuehn who suffered from Hepatitis C but wasn't lucky enough to receive a donor in time. The band puts their backbone into "Estimated Prophet" with Herring fluttering down tons of notes and Warren wah-wah'ing with abandoned. The Rhythm Devils bang and slap their drums with grace and march the band forward, bringing a bit of the Left Coast up to the 518 with this one. "The Other One Jam" that they morph into isn't full blown, but it is a nice twist and you can tell Phil in particular wanted to make this version special for a lost friend. A fun tribute to a fallen friend. The set closing "Music Never Stopped" seemed to hint at some cosmic guitar work between Herring and Haynes around the 6 minute mark, but the band decided that was the right time for a set break. When they came back Bobby picked an acoustic version of "Me and My Uncle", looks like Phil got to Jam to start one set and Bobby got his acoustic number for the other. 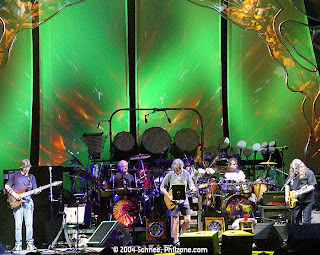 There were riffs between the two hinted at all tour and after this summer they wouldn't tour again as "The Dead" for a few years but this was a sweet touch for Bobby to play for his "spiritual uncle" and really his only main contribution for the whole mega second set to follow. 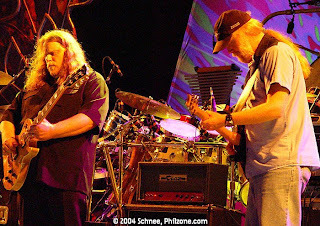 "Me and My Uncle" allows you to hear Chimenti's piano addition to the group pretty clearly as he helped create a western vibe for the opener and stays active throughout the rest of the night, but the set really started cooking with the opening notes of "Cryptical Envelopment". 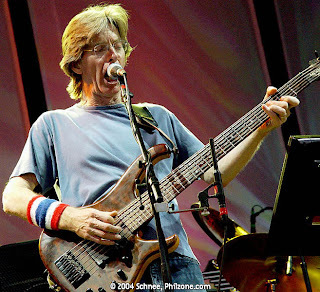 Phil may mumble the lyrics to get things started but the night cracks open up with the instrumental section and the band seemed come together as Lesh bounds along on the bass rumbling and leading while the two southern fried guitars keep tossing licks back and fourth effortlessly. Just when you think the band is going to fall into some trippy jam section, they morph right into the blues of my favorite song of the night, "Death Don't Have No Mercy". I just recently talked about a great cover version of this tune by Dax Riggs, but god dam if Warren Haynes doesn't sing up the devil with this one. This cover is just sublime...it has everything a pumping organ, an alive bassline, slide guitar glory, and fearless drummers. If you are not sure about listening to this whole set, just do yourself a favor and check this tune out, another nod to Garcia being gone, and a solemn one. A slow "Birdsong" comes next and moves at a trudging pace, you can hear Herring trying to speed things up with his fretboard runs and multi-tiered scale runs, trying to get the band moving, but they aren't buying it and are content to stroll. This is another toast to Garcia in a more subtle way; since his death Phil has changed the lyrics slightly during different performances of this song to make the "she" in the song (originally written as a Janis Joplin tribute) into a "he" to honor his brother Jerry and on this night he does so during the second verse. A Garcia classic is next and one of the songs I can not understand why the group didn't play more, "Reuben and Cherise". It was a welcomed surprise on this night and certainly another nod to the Jerry, as he would play and record this one solo. Warren takes charge of the lyrics and from the minute this one started the crowd was fired up to hear him twist and turn through the tale of ill-fated lovers. I was personally ecstatic when they started playing this one as it is one of my all time favorite Jerry related tunes and to hear one of the most soulful singers in rock tackle it was a joy, re-listening it holds up better then I even remembered it from that night. Flying high after that the Rhythm Devils took control with "Drums" eerily banging out under the trees and stars before the group stolled back n for some "Space". What rolled out next was easily the biggest surprise of the night and another tribute to the missing frontman, a cover of Pink Floyd's "Shine On You Crazy Diamond". It is exciting to see the original members branch out and allow the newer people to suggest these songs as I imagine Chimenti or Haynes did for this number as both have covered it in the past. 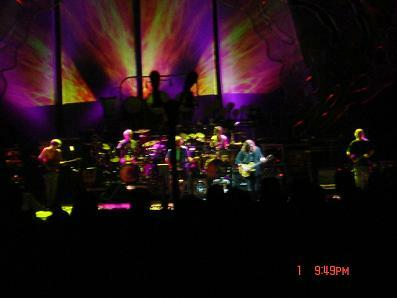 and here is a snippet of The Dead playing it live a few nights later. The Dead first broke this one out at Bonnaroo but tonight's version is just as touching, flowing out and letting Warren rip; a really cool moment for fans of good music. The cover straddles around the original, and both Warren and Jeff's cover variations with Phil playing louder then he had all night. The set goes back to some Dead favorites then, granted some songs that were few and far between in the recent live setting with "St. Stephen" that got massive cheers and people up and dancing. Herring took over the lead guitar parts with his quicksilver like leads dripping everywhere and Warren filled in accordingly. 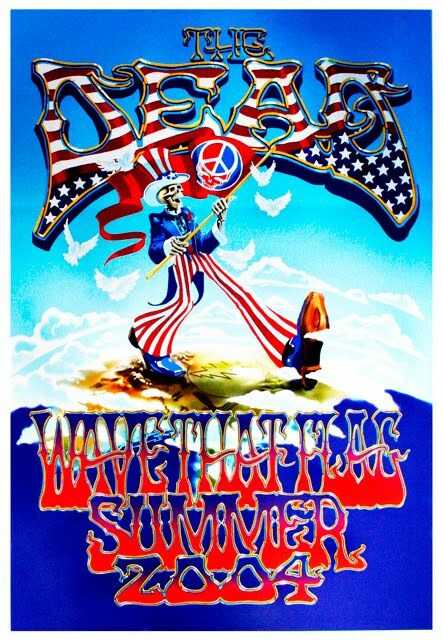 The duo are a perfect match for this music; soulful yet technically gifted it seems they can go in 5 directions at once spiraling and wailing with energy that was honestly lacking in most of the later years of the Grateful Dead. While they are more reigned in here then when Playing in the PLQ, they still let the music grow and punch up the tempo whenever they can. 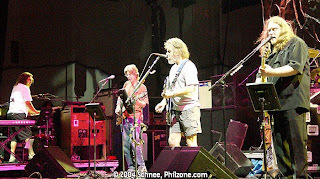 Bobby was almost non-existent in this second set and I have to say that is a pretty good thing. Letting Warren take control of the ballads including the next one "Comes A Time" was the right call. His voice just fits so beautifully with the notes and scales. "Comes A Time" is another personal favorite that was a treat to hear and if Bobby had taken the lead vocals I doubt I would have felt that way. The fact that the band chose this ballad to play instead of "He's Gone" is a very nice touch. The straight up solo's after the lyrics are passionate as was the whole second set really, then the band decides to freak things up a bit actually going into "The Other One" which they hinted at earlier in the night. "Going Down The Road" was a highlight to the dancers in the crowd getting folksy and dusty as they scouted around. 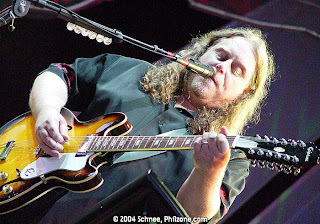 A surprising but touchingly poignant set closer was the old hymn-like "Angel Band" that Jerry used to cover with Old and In The Way, gotta say I was not expecting that one and again it shows some taste avoiding an obvious choice such as "Wharf Rat". The whole show is a glorious tribute to the man many people were missing. Phil knew this one was a bit special and told the crowd to "Dig Yer'selves!" which is a great line that I still use in various forms today. The encore also lets you know how much Warren meant to the boys this tour allowing him to play "The Real Thing"
A hell of a second set makes this one worthy of your time, even if you never found yourself getting into post-Jerry versions of the fellas check it out. Maybe it is my love of Warren and the personal favorite songs or memories of the night but I do go back to this one periodically (as well as some PLQ shows) when I want a different spin on the Dead history. Give it a try, and go hit Saratoga when you can, all the best and thanks again to those who joined for a great Travers. Really nice review, I can't wait to listen to this. BTW, I'm totally with you on all the other points you made. Thanks Llama, let me know what you think of it, especially the second set, I think I like it better now then when I was there live. Hope the move went smoove this weekend.